COTLI: New Tier 3 11th Objectives & Missions! Tags: crusaders, update, new, tier 3, 11th, objectives, missions. Today's update includes additional Tier 3 11th Objectives for Grimm's Idle Tales, Mischief at Mugwarts, and Ready Player Two, with rewards for each that are sure to help you push further than ever before. 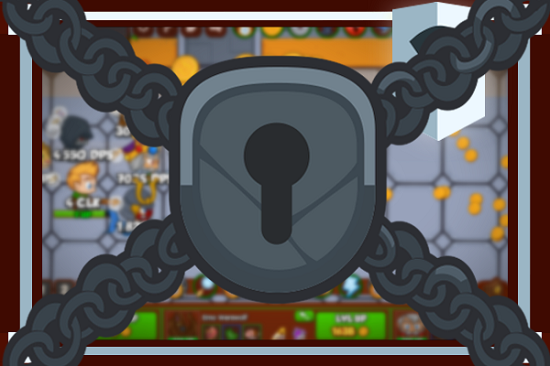 This update also includes additional Missions, allowing players to recruit and earn equipment for the remaining Tier 3 Event Crusaders! You can find more information about the additional Tier 3 11th Objectives below. Are you excited!? We are! Grimm's Idle Tales: Which is Witch? 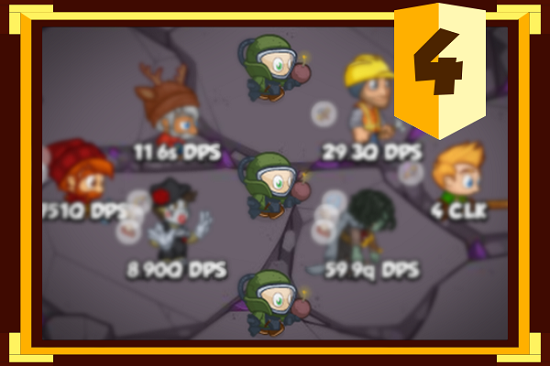 Note: this objective requires that all T3 Grimm's Idle Tales objectives are complete in addition to the Ghostbeard's Greed T3 11th objective. Wicked women and innocent ladies spawn at random. Both can only be damaged by clicking. Wicked women kill the front column of Crusaders upon reaching the formation. Innocent ladies disappear harmlessly upon reaching the formation. Killing an innocent lady spawns an invulnerable ghost which deals high damage. Reward: 10% extra rubies from objective completions. Also it's retroactive, so by completing the objective, you get bonus rubies based on how many objectives you've already done. Note: this objective requires that all T3 Mischief at Mugwarts objectives are complete in addition to the Grimm's Idle Tales T3 11th objective. A sorcerer and a serpent take up slots in the formation, changing every 50 areas. The serpent constantly deals damage to adjacent Crusaders, except Fire Phoenix. The sorcerer disables the DPS of all Crusaders except Fire Phoenix. Fire Phoenix's "Evil Eye" upgrade has been replaced with "Phoenix Tears" which heals her and adjacent Crusaders. All other Crusaders' healing abilities are ineffective. Reward: Your maximum Sprint area is now doubled. Works even if you haven't maxed out the Sprint talent yet. Note: this objective requires that all T3 Ready Player Two objectives are complete in addition to the Mischief at Mugwarts T3 11th objective. Monsters can only be damaged by projectiles, explosions, and clicking. Many monsters are replaced by ranged monsters. Ranged monsters can't be damaged by clicking. Some ranged monsters spawn grenades on death. 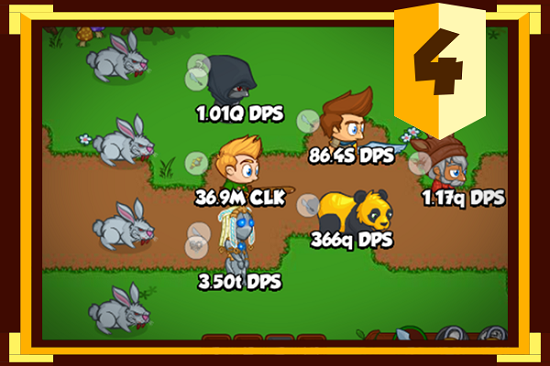 Grenades damage the front column of the formation for 50% of their max health. Reward: Maximum number cap raised to 1e600, up from 1e400. Tags: new, campaign, amusement, park, doom, t3, tier 3, objectives. Tags: new, tier, 2, two, weekend, buff, objectives. It's time to give you some more challenging content and today we launch 15 new Tier 2 objectives for both the Idols Through Time and Amusement Park of Doom campaigns. For those of you who have just joined us, we should supply you with a quick recap! First of all, you're going to need to know more about Talents, so you should read this blog post. Once you're up to speed, you'll need to use your idols to buy the Tier 2 Talent Doing It Again in the Utility tree, and hey presto! Once you've beaten any Tier 1 objective, you'll now see the new Tier 2 objectives that are available. 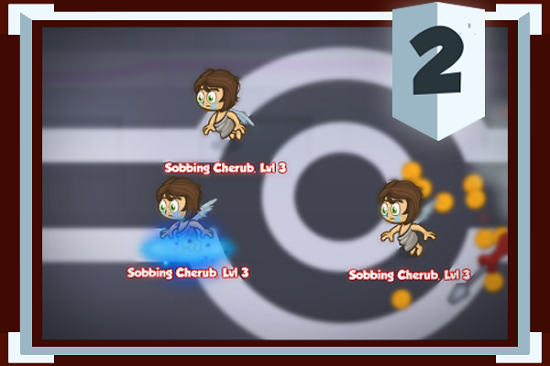 The Cherubs now move faster than before and you have to reach area 550. Only the male Crusaders from the base 20 Crusaders are available for selection. 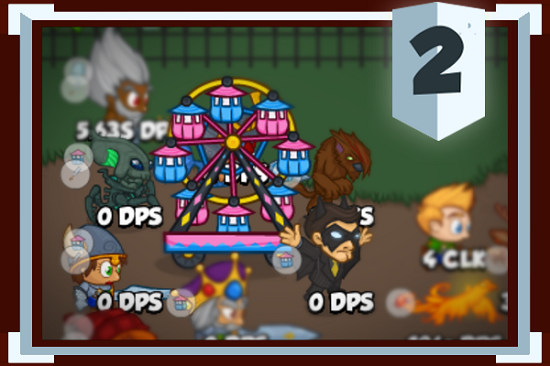 Every time a Crusader gets moved by the Ferris Wheel, their formation abilities and DPS are disabled for 5 seconds as they reorient themselves. Each mauling mascot spawned now reduces your global DPS by 50% multiplicatively. These are just four of the 15 new Tier 2 objectives for both Idols Through Time and Amusement Park of Doom. To help you through the tough new Tier 2 objectives, there's a weekend buff. The following Crusaders will get a buff this weekend starting from today until 12 pm PDT on Monday August 21st. Also, check out the limited-time Doomed Jeweled Chests that contain equipment for the five Crusaders above! New Tier 4 Objectives & Weekend Buff! Okay, so you thought you were all that and bag chips, did you? Well, we have news for you. Today we launch 12 new Tier 4 objectives for both the World's Wake and Descent into Darkness campaigns. These new very challenging objectives are going to keep even the most advanced Crusaders players working hard to complete them. For those of you who have just joined us, we should supply you with a quick recap! First of all, you're going to need to know more about Tier 4 Talents, so you should read this blog post. Once you're up to speed, you'll need to use your idols to buy the Tier 4 Talent Fourth Time's The Charm in the Utility tree, and hey presto! Once you've beaten any Tier 3 objective, you'll now see the new Tier 4 objectives that are available. In addition to the tier 1, 2, and 3 requirements, Crusaders with the support tag can no longer be used and you must beat area 700. The monks now move around the formation until you beat area 750. Defenders of the Realm attack your formation, trying to destroy Grond. Don't let them! Beat area 750. Walking bombs now spawn. Don't let them reach you while you work to beat area 850. 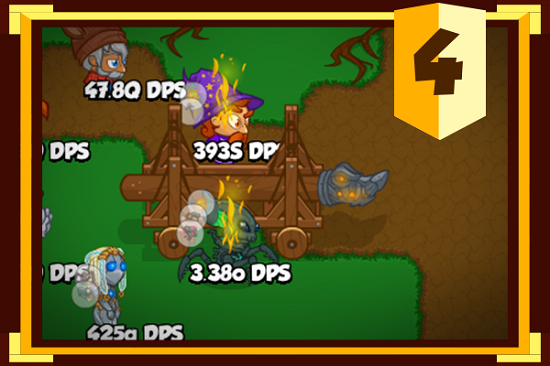 These are just four of the 12 new Tier 4 objectives for both Worlds Wake and Descent into Darkness. We're looking forward to seeing how you get on with them. To help you through the tough new Tier 4 objectives, there's a weekend buff. The following Crusaders will get a buff this weekend starting from today until 12 pm PDT on Monday July 31st. Also, check out the limited-time Challenger Jeweled Chests that contain equipment for the five Crusaders above! 11th Objectives Update and a Weekend Buff! Tags: new, objectives, 11th, objectives, priestess, time, agent, 79, strike, weekend, buff. Have you been looking for an extra challenge? Then we have just the thing. Following on from our 11th Objectives update we've added two new advanced objectives to two campaigns. However, the rewards are worth it: Two new Crusaders can be unlocked, The Priestess of Time and Agent 79. 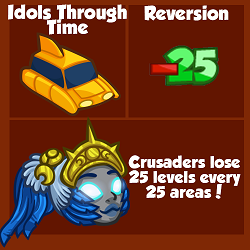 The first of the two new objectives is Reversion in the Idols Through Time campaign. Your Crusaders must beat area 750 but every 25 areas, your Crusaders will lose 25 levels. We didn't say it was going to be easy. If or when you're successful, you'll unlock The Priestess of Time. She has some awesome abilities. 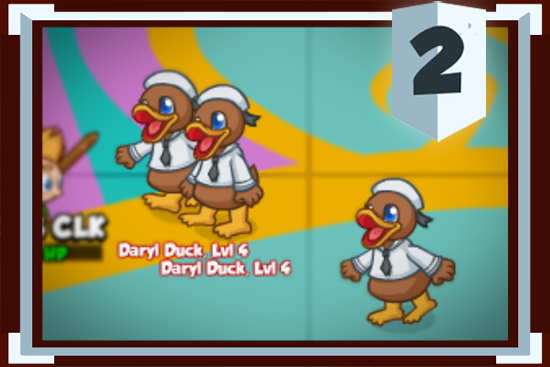 At level 25, Time Stop freezes random enemies every 10 seconds for 20 seconds at a time. At level 600 enemies take 100% more damage! 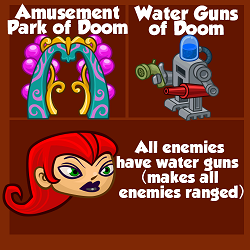 The second of the two new objectives is Water Guns of Doom in the Amusement Park of Doom campaign. All enemies have water guns that they constantly shoot the Crusaders with. Occasionally, a big beefy water-powered water-gun toting robot appears and shields all other non-water-powered-gun-robot enemies until killed. The insane action goes all the way to area 775. Beat the objective and you'll unlock Agent 79, a support Crusader specialising in ranged attacks. At level 100, Ricochet Training makes all projectiles have a 15% chance of bouncing and causing 50% damage to an additional monster. Better still, the ricochet can bounce up to five times if you're lucky! 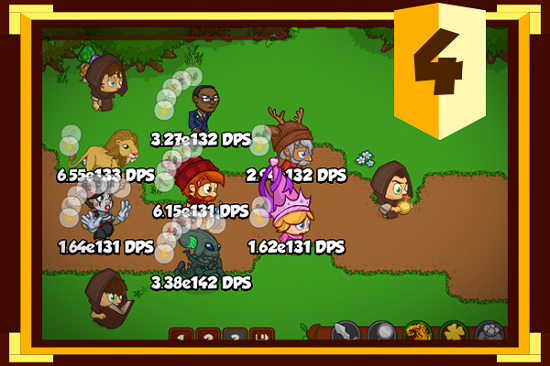 At level 400, Explosive Ammo makes all projectiles explode on impact, dealing 25% of their base damage to all nearby monsters. But wait, we have more! Five Crusaders will also get a A Time to Strike weekend buff! From today until Monday, July 10th at Noon PDT, Draco, Mr. Monkey, Artaxes, King Reginald, and Greyskull all get a limited time buff applied automatically. The new objectives and Crusaders are all available from today. Good luck, Crusaders!